4.0 out of 5 based on 195 bloggers and 20 commenters. 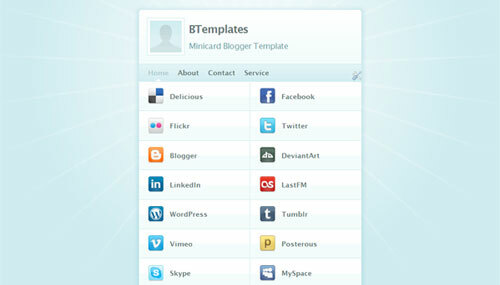 Minicard is a free premium blogger template adapted from WordPress with 1 column, web 2.0 design, fresh look, rounded corners and social bookmarking icons. Wow, that’s an amazing template for Blogger. Thanks. Coloquei este seu template no meu blog, e tive que tirar, porque só aparecia o ícones diversos. Não aparecia minhas postagens e nem como acessá-las. Você poderia me dizer o que fiz de errado? Agradeço sua atenção e te desejo um ótimo dia. @Thymonthy Becker: Como podrás obserrvar en el demo, la plantilla es una “mini-card” o tarjeta virtual de presentación; no es que contenga errores, pero su función no es la de una plantilla común para publicar posts. Saludos! i do like this a lot, but if i do use this.. must i share the links below? it seems kinda pointless if i share someone else’s business card within my own business card..
Hay alguna manera de poner la plantilla a funccionar como un blog? Sería interessante tener el VCard e un enlace para um mini blog. Perdoame mi español. hi there! this is really very useful, not mention an outstanding design. thanks very much to BTemplates for the conversion, and Mike Jolley for creating and sharing it. BTW, is it possible to customize the color scheme? thanks for sharing gan, klo leh nanya ini bisa diganti fontnya ga??? I want 2 pages on my top tab (index). I select Show Pages As Top Tabs, but when I save arrangement, it changes back to Show Pages As Side Links. Does somebody have a solution for this?